I was not a fan of the banana when I was a kid. 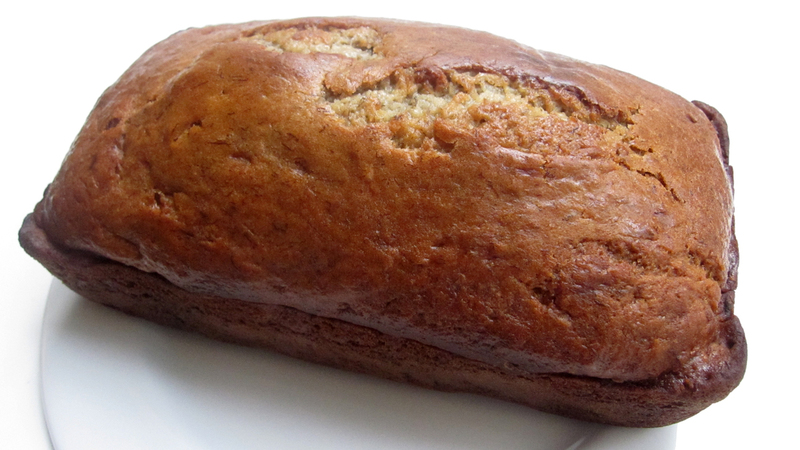 However, I did love my mom’s banana bread. Now that I’m slightly more grown up, I eat them both with gusto. As I mentioned in the baklava post, recently Boy and I had to reorganize our freezer and I realized we had seven bananas in there, which was a little excessive. That of course meant it was time to bust out the banana bread recipes and naturally, once we had the bread made, we also had to make some banana delicious pudgy pies. So for your baking pleasure, we’ve got two great banana bread recipes for you and a flying saucer sandwich. In a medium sized bowl, mix the two flours, baking powder, baking soda, salt, and 1/4 cup of the sugar. In another bowl, mash up the bananas with a fork, along with the yogurt and vanilla to create a thick custard with small lumps of banana. The mixture should be fairly smooth but unless you throw your mixture into a food processor or take an immersion blender to it, you’ll still have some light banana texture in there (which is a-okay by our accounts). Pull out your mixer and on medium-high, cream the other 1/4 cup of sugar and butter until well combined and slightly fluffy (about 3 minutes). Add the eggs one at a time and beat well after you add each one. Reducing the mixer speed to low, beat in one-third of the flour mixture until it’s more or less combined. Then add one-third of the banana / yogurt mix and beat until combined (you may need to use a spatula to scrape down the sides of the bowl to get it all in). Repeat that process two more times, until you’ve incorporated all the flour and banana mixture. Cook’s says be careful not to overmix the batter which should at this point be rather thick and chunky. Truthfully, we’re not sure exactly what “overmixed” looks like but we just don’t leave it mixing much longer after it all looks combined. Now pull out a 9-inch loaf pan and spray the bottom and the sides with nonstick spray. Pour the batter into the loaf pan. At this point, if you’re just going for the bread, you can add some nuts on top but for flying saucer sandwich making, it’s better to leave the nuts for later. Bake the loaf until the top is golden brown and a toothpick (or cake tester) poked in the middle comes out clean with a few crumbs but no batter. That should be about 50-55 minutes. If your oven is sensitive, make sure to rotate your loaf at the 25 minute mark. When it’s all baked up, pull the loaf out of the oven and let it cool in the pan for 10-15 minutes. Then pull it on out and let it cool on a wire rack and drink in all the glorious smells of your work. 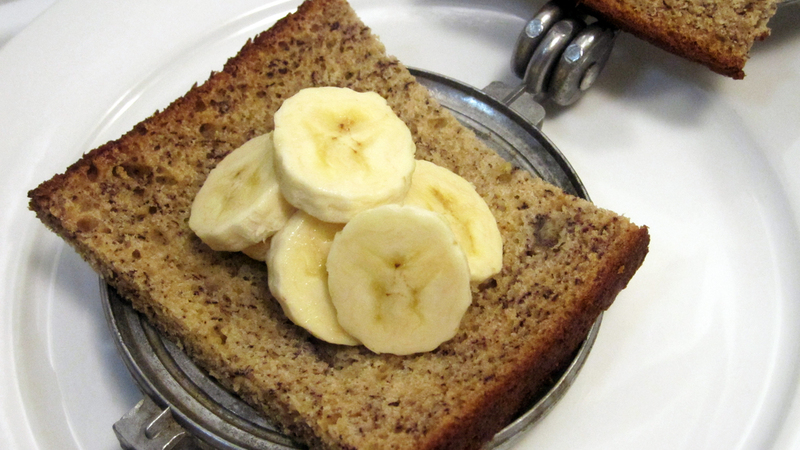 OR…for another banana bread recipe near and dear to my heart, here is my wonderful mom’s. Melt butter and blend in sugar. Mix in beaten eggs and mashed bananas, blending until smooth. (I also add 1 tsp of vanilla when I put in the eggs and bananas but the original recipe didn’t call for it.) Sift flour with baking soda, spices and salt. Stir in whole wheat flour. Add dry ingredients alternately with hot water (or soy milk). Add nuts if you use them. Bake in a 9 x 5 pan at 325 degree for 1 hour and 10 minutes. Yield is one loaf. Can be baked in muffin tins or small loaf pans too in which case baking time is more like 30-35 min. I have lately taken to not putting the cinnamon or cloves in and just putting the nutmeg in. Do what you like. It is good any way, just with fewer spices, you get more of the banana flavor. 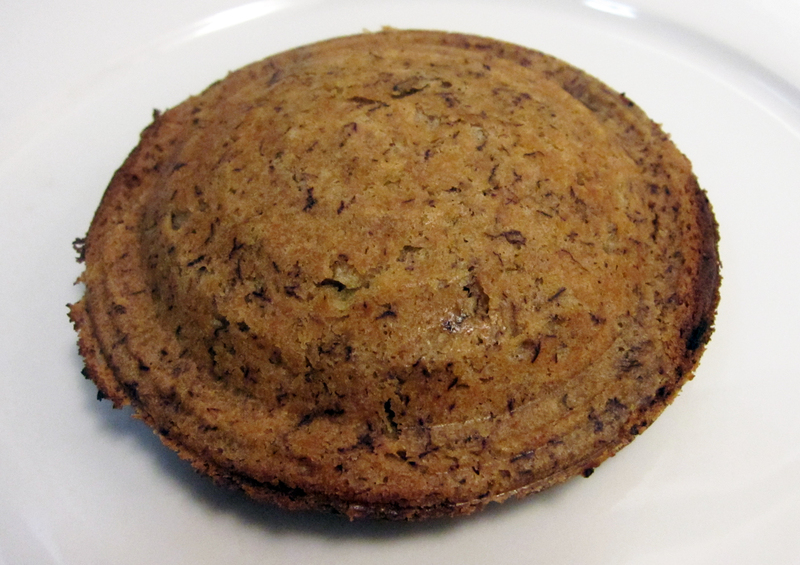 Now…regardless the banana bread recipe you use….let’s make us some banana flying saucers of awesome! Start by opening your pie iron and coating the inside with nonstick spray. Place one piece of banana bread on the grill and then on top of that, add the peanut butter. You can use more or less depending on your taster. On top of the peanut butter, stack up your banana slices. If you’re including the honey (best for sweeter palettes or if your banana isn’t as ripe as you’d like), drizzle it on top of the banana. Finally, add your second slice of bread to complete the sandwich. Close your pie iron, trim any excess bread, and toast for 2-3 minutes on each side over medium heat until the bread is golden brown (or toasted to your liking). When you’re ready pull it from the grill and let it cool off so the peanut butter doesn’t burn your tongue with the first bite. 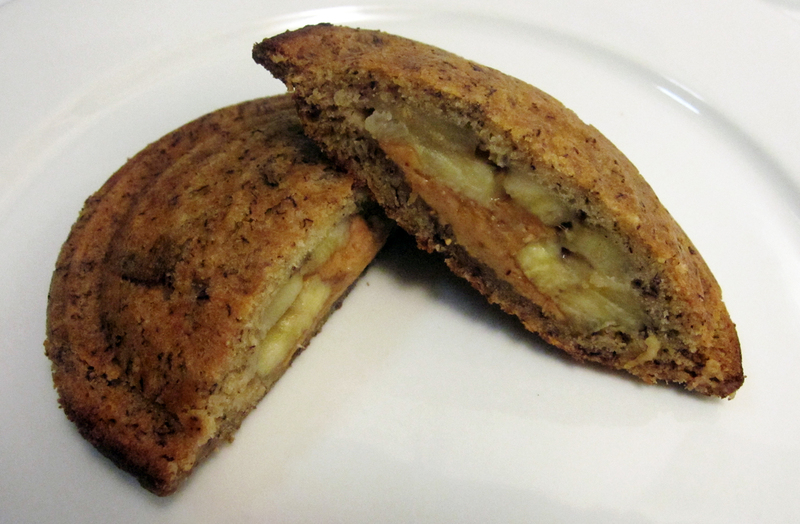 Then get on in there and revel in the banana goodness. I personally don’t like overripe bananas. And my definition of overripe is…if there’s even a spot of brown on it, it’s too far gone for me. It’s not that I like them green exactly but I definitely don’t like them close to mushy. That means if Boy and I aren’t on top of eating our fresh bananas, we end up with quite a few of them in the freezer. Once they start going brown…I just let them go until they’re really dark since I stock them up for making bread at that point. If you do the same, you can keep your frozen bananas for quite some time until you have enough to make your bread. However…when thinking about which banana you want to use for the slices inside the flying saucer sandwich, a riper one is better for the sweetness levels. If you have a fresh banana that’s on the less ripe side of the scale, drizzling a bit of honey over the banana is a good way to go to get that extra flavor. 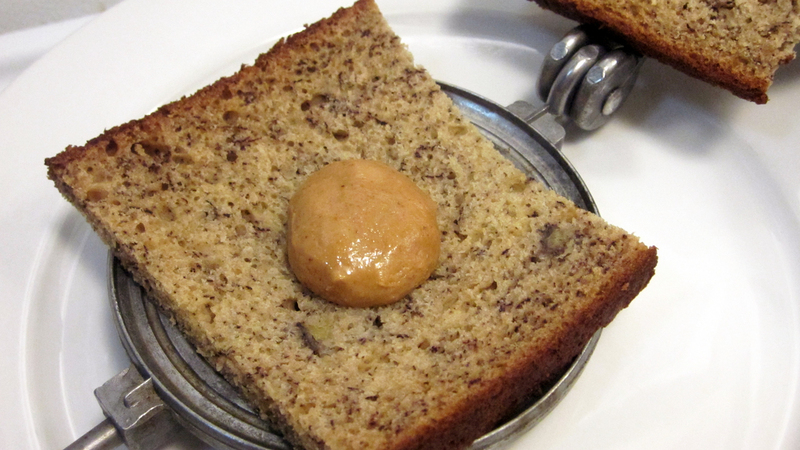 And…if you’re not such a fan of the sweet and savory of the banana and peanut butter, you can just go banana and honey inside your banana bread flying saucer sandwich and go sweet all around. That’s pretty darn tasty too.